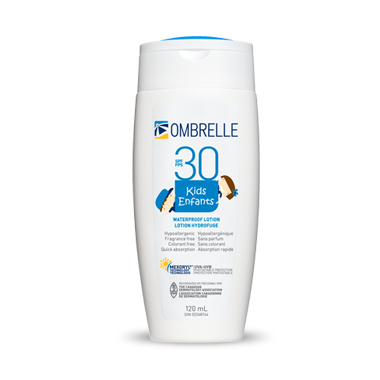 Discover Ombrelle's moisturizing Kids SPF 30 sun protection that is specifically formulated for children. Dermatologist recommended. This water resistant and fast absorbing formula provides broad spectrum photostable protection against UVA & UVB rays. Ingredients: Active Ingredient Actif (w/w): Titanium Dioxide: 15%. Non Medicinal Ingredients: Aqua, Dimethicone, C12-15 Alkyl Benzoate, Isohexadecane, Talc, Styrene/Acrylates Copolymer, Isododecane, Caprylyl Methicone, Dicaprylyl Ether, Triethylhexanoin, Dicaprylyl Carbonate, Dimethicone/PEG-10/15 Crosspolymer, Aluminum Hydroxide, Stearic Acid, Pentylene Glycol, DL-Alpha-Tocopherol, Phenoxyethanol, PEG-9 Polydimethylsiloxyethyl Dimethicone, Magnesium Sulfate, PEG-8 Laurate, PEG-9, Polyhydroxystearic Acid, Propylene Carbonate, Caprylyl Glycol, Disteardimonium Hectorite, Aluminum Stearate, Alumina. I really like this product. Easy to apply and not greasy but holds up well in water. Not too smelly either. It's good but a little too liquid. We were recommended this sunscreen when our son was a baby and had eczema. It was the only sunscreen we tried that didn't give him a breakout. We love it - and it lasts forever, as a thin coat lasts hours, even in water. We still use it for him (he's four now), and also for our one year-old daughter. It's pricey, but if your children suffer from sensitive skin or eczema, it's great!